Bulgaria is one of the poorest countries in Europe: its population has suffered due to the social and economic changes that the country has experienced in the past decades. SOS Children’s Villages is very active in the local community, providing support to families, young people and children. Trjavna is a small town located in central Bulgaria, about 250 kilometres east of Sofia. Traditionally the town had an important textile industry and it is also a tourist destination as people are attracted to its beautiful natural and historical sites. However, many people struggle to make a living, especially as the unemployment rate in the area has increased in recent years. Many children lose parental care for complex social and economic reasons. Children who grow up in single-parent families and in households with many siblings are particularly likely to end up living in poverty. Given the economic circumstances of the country, young people, those over the age of 50, people with disabilities or from a Roma background find it particularly hard to get a job. A significant number of people have moved abroad in search of work. In some cases the children are left behind and do not receive enough support from their extended families. The economic conditions for families and children were bad during the transition period after Bulgaria became independent from the Soviet Union. In fact they were so critical that SOS Children's Villages initiated emergency aid programmes on various occasions. We distributed food, medical supplies, as well as baby and winter clothing. In response to the economic and social hardship, our organisation also launched a family strengthening programme to support children at risk of losing parental care and to encourage families to stay together. The more permanent programmes, such as the provision of care and support for families, young people and children, have continued to improve life for many in the local area. Our organisation plays an active role in advocacy work, working alongside the government and other agencies to improve the situation of children in Bulgaria. 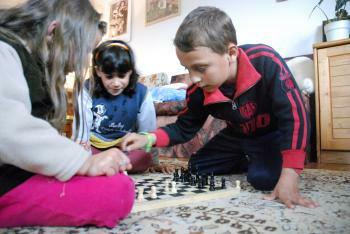 SOS Children's Villages started working with vulnerable families in Trjavna in 1993. Strengthen families: SOS Children's Villages works closely with the local population. In order to support vulnerable families in the neighbourhood, community outreach programmes have been initiated in Gabrovo and Veliko Tarnovo which are towns near Trjavna. The family strengthening programmes are run in collaboration with the local authorities. We make sure that children have access to essential educational, nutritional and health services. We also help mothers and fathers by giving them advice on parenting and how to generate income. Families in the area are likewise provided with counselling and psychological support. Care in SOS families: When children can no longer live with their parents, they are cared for in one of the SOS foster families or in small group homes. They receive support from SOS Children's Villages. The foster families have been selected and trained by SOS Children's Villages to ensure that the children are cared for to the highest standards set by SOS Children's Villages. In order to do this, we provide continuous social and emotional support. Most of the children are from the area and this is important to us as we continue to work with the families of origin so that they can remain in touch with the children, wherever possible. The children in our care attend the local schools and kindergartens alongside children from the community. They can spend time together in the playground and the sports complex. In addition there is a workshop and community building where numerous activities are organised. Support for young people: We support young people until they are able to live independently. We give them access to further education and vocational training so that they have the right skills to find a job, or start their own business. With the support of qualified staff, the young people learn to shoulder responsibilities and make their own decisions.